The essence of team-work, of owing responsibility of one’s actions that could impact the entire squad, stood out prominently in India’s campaign in the Asian Games on Friday. Despite the best efforts by the women’s hockey outfit, it was left gutted after a 1-2 defeat by Japan in the gold medal match, but two sailing pairs and the women’s squash team made up somewhat. The hockey match was tightly contested with stoic defending rather than attacking play dominating it. Minami Shimizu deflected a penalty corner strike to give her side the lead in the 11th minute. India mounted pressure in the second quarter and Neha Goyal was able to take advantage of some space in the Japanese circle to fire home a reverse by Navneet Kaur. Japan’s winning goal came in the 43rd minute when Kawamura Motomi slotted home a penalty corner, leaving India to search for an equaliser. Japan, eager to forge a classy team ahead of the Olympic Games that it will host two years from now, defended the lead, working hard to maintain possession. In a match in which India had twice many cracks at goal as its rival, it was the famed Japanese precision that stood out. The determined Japanese defended without being ruffled, even when India moved in an extra player on the field in place of goalkeeper Savita. The silver medal is India’s best finish since 1998 but the wait for gold, won last in 1982, will extend four more years. On the squash court, as expected the women’s team surprised Malaysia 2-0 to enter final with Joshna Chinappa battling hard to hand the fancied Nicole David — of the six Asian Games gold and a silver fame — a rare defeat in the quadrennial festival of sport. Chinappa was a picture of determination as she won the classic 11-9 in the final game. Dipika Pallikal Karthik rode on the momentum and clinched a 3-0 win against Wee Wern Low to seal India’s entry into the title round where it has the chance of avenging a defeat in the league by Hong Kong, which beat Japan 2-0 in the other semi-final. In the men’s semi-finals, Hong Kong carried too many guns for Saurav Ghoshal and Harinder Pal Singh Sandhu and won 2-0. The team-work theme had started on the Java Sea where India won three medals, its best showing in an Asian Games sailing competition after 1982 when CK Pradeepak (OK Dinghy), Zarir Karanjia & Farokh Tarapore (Fireball) and Fali Unwala & Jeejee Unwalla (Enterprise). There was reason for the Yachting Association of India officials to be delighted with the triple medal haul. The bronze medal won by Varun Thakkar and KC Ganapathy was perhaps the toughest achieved in the Jakarta Bay on Friday. The 23-year-old lads had been riled up by Oman’s protest and subsequent disqualification in the 14th race on Wednesday. They had a whole day to first lick their wounds and then wind themselves up to deliver a high-quality performance on Friday. Back in 2013, the duo had a bad start in Denmark, but held together to turn in a stellar performance. It was time for them to recall that and replicate it on Friday afternoon. The duo had to finish at least three places in front of the Omanis. They did that in great style, winning their fifth race. With the Omani team finishing fourth, the bronze went to the Indians, who had more first-place finishes. 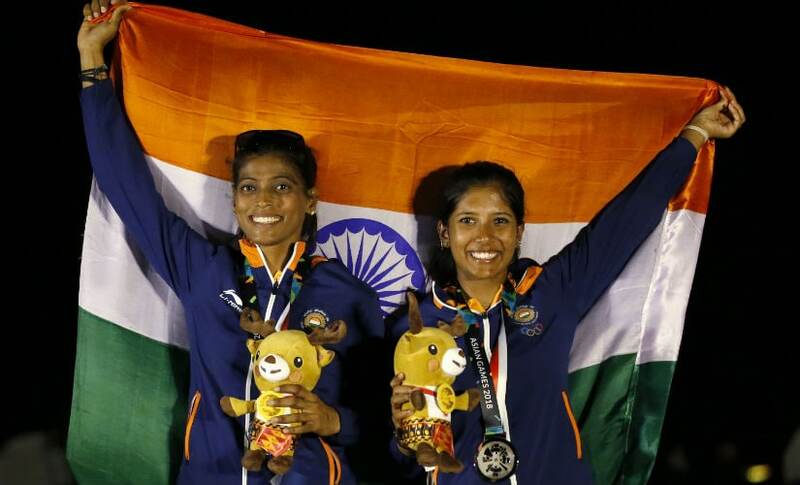 Varsha Gautham and Sweta Shervegar’s travails in securing an entry to the Asian Games are too well known to be recounted. On Friday, by finishing with the silver medal in the five-boat 49er FX women's competition, they were able to say thanks to the powers-that-be in the Indian Olympic Association and the Delhi High Court. They were presented with a simple task: finish the race without incident to ensure silver medal for themselves. The Singapore crew secured the gold by winning each of the 15 races. 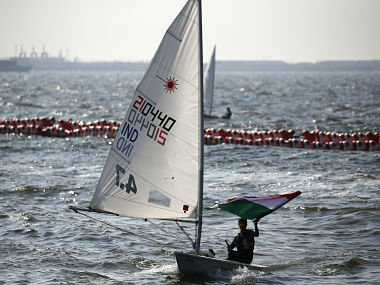 The Chinese crew, which had more second-place finishes, was out of medal reckoning as soon as it was disqualified in the 14th race. It left India with only having to finish the race and take silver. There was massive disappointment in the Indian boxing camp as Vikash Krishan Yadav had pulled out of his 75kg class semi-final owing to the cut he suffered during his bruising bout in the previous round which he won on a split verdict. It left Amit Panghal with the onerous task of ensuring an Indian component in the boxing finals. The 49kg class boxer handled such pressure and his 20-year-old Filipino opponent Carlo Paalam with confidence to extend his run to the gold medal match on Saturday. He earned a 3-2 split verdict with judges from Uzbekistan, Algeria and Indonesia scoring the bout in his favour while the Chinese and Japanese judges gave it to Paalam. 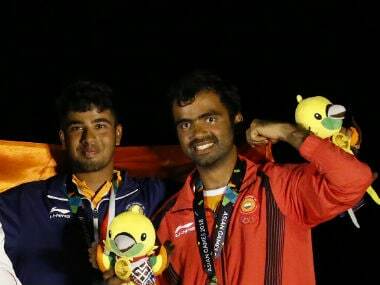 There was a surprise in Canoe Double (C2) 200m men's semi-final when Prakant Sharma and Jamesboy Singh Oinam combined to power themselves into the final. The Kayak Four (K4) 500m women's final will also see an Indian presence as a direct entry. For a discipline that accounted for 49 Indian entries across 11 medal events, it cannot be seen as anything but scrapping some pride. There is good reason why we are discussing Hoshangabad teenager Harshita Tomar’s bronze medal in the Open Laser 4.7 class at the very end. Like Govind Bairagi who finished fourth, five points behind her, Tomar was spotted during a talent hunt and groomed at the Madhya Pradesh State Government-run Sailing Academy on the Upper Lake in Bhopal. The Moldovan coach with the Indian team, Alexander Denisuic, admired Tomar’s mental skills, saying that the wiry 16-year-old read the conditions well and challenged the best. He said she had a bright future, considering her race awareness, but would have to move into a higher class of racing by first adding 10kg of muscle to her lithe frame. She is the youngest of the Indian medallists in the Asian Games regatta and if the Madhya Pradesh Government continues to back her evolution as a sailor, she would graduate to the higher echelons of sport. It may also encourage other States, especially Tamil Nadu and Telangana, Maharashtra and Goa to think in terms of competing with Madhya Pradesh. And in that, Team India may be the biggest beneficiary.